Empowering Youth — Educate! | Preparing youth in Africa with the skills to succeed in today’s economy. Over the last three months Educate! has been training eight new teachers. The teachers will start teaching Educate!’s Leadership Curriculum this month to our third class of students . During the training, the teachers were tasked to work with out of school youth to start youth social enterprises. Below, the teachers recount their amazing success stories of how they worked with out of school youth. Kamwanyi community is located in the dirty slums of Nsambya, about 2 miles from Kampala city. The first thing that welcomes you to this community is the stench from the rubbish and clogged up trenches. The area is mainly inhabited by the poor police force and their families, whose living conditions are unpleasant. It is also a hiding place for some school drop outs who have turned to drugs, alcohol, pick pocketing and gambling. It was among these youths that our new teachers recruited students to take a five week workshop where they would undergo mentorship and be challenged to start a social enterprise. During this time, our new teachers gained experience in empowering young people to start social enterprises in preparation to teach the course in our partner schools. They also did this to equip the youth with skills to solve the problems their communities faced. These 18 young people through the guidance of the mentors have managed to start social youth enterprises that have impacted over 300 people in their communities. After five weeks of mentoring, slowly by slowly, the youth discovered their unique abilities and talents. With the mentors’ help, they were able to start a paper bag and jewelry making project to recycle paper. They set up two groups: ‘Recycling Youth ‘and ‘Women Ahead ‘to manage the paper bag and jewelry making project respectively. The youth were able to raise about $2.50 dollars to kick start the paper project. In the first week, the recycling youth were trained in paper bag making by their colleague. Three weeks later, 300 hundred small size paper packs were made. And in the fourth week, 50 hand-made gift bags were sold at the Educate! Alumni Event. The results are amazing: the group raised $45 dollars and can now rent a shack workshop at $5 dollars per month! To them, this is no ordinary business; they consider it a model enterprise. The youth have just launched a rotational fund scheme were they will allocate credit to each other to invest in small income generating activities. This is the first step towards their vision of creating a wealthy community and their mission of promoting entrepreneurship amongst out-of-school youth through micro-credit and savings. Women Ahead comprises of only girls and women. They were able to raise about $30 dollars to kick start the jewelry making project. 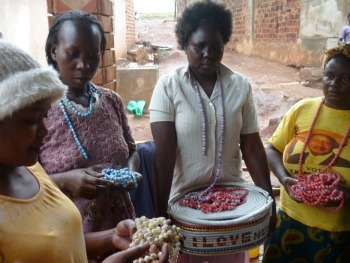 The women have now perfected the skill and have orders worth about $682 dollars from Lillian Aero, an Educate! Alumni. So many lives have been changed and communities transformed by these young men and women who were once looked at as criminals. The youth are now empowered and are looking forward to empowering their peers and cause changes within their communities. To think that this is just the beginning of their contribution to the community is an assurance that the best is yet to come! This- in their own words- is ‘Recycling Youth’.